Virginia “Tiny” Charlo is technically a Salish princess. The maroon grizzly paw that covers the top of her left wrist — the outline inked in jail by a sharpened staple — pays tribute to her great grandfather Chief Charlo of the Salish Tribe. The paw was filled with a muted maroon at a real tattoo shop in Missoula after she was released from jail in 2011 for a felony DUI charge. Despite stifling her screams as the staple poked her wrist bone, Charlo couldn’t stand the pain of her jail tattoo after the solid outline. Charlo’s grizzly paw is her only tattoo not rooted to a past relationship. It’s one of her favorites. The rest of her tattoos stand as reminders of physically abusive partners. When Charlo is tempted to do “bad things,” she thinks of her case manager, Susette Billedeaux, sitting on her shoulder and giving her advice. These are the things that could break her sobriety or probation, prolong her driver’s license revocation, keep her away from her beadwork and family, and ruin her dream of owning a house with walls covered in painted mountains, streaming water and Native American art. But not real water, she is quick to point out. Even when Billedeaux is not physically around, Charlo can hear her voice telling her to do the right thing, and she listens to it. Charlo met Billedeaux in 2016 through the Confederated Salish and Kootenai Tribes’ (CSKT) Tribal Defenders Office, where tribal members are provided a public defender. While in jail on charges of driving with a revoked license in 2016, Charlo heard about the re-entry program that the CSKT tribal defenders offered. After jail release, she entered the program when she returned to the Flathead Indian Reservation. It was a turning point in a lifelong struggle with alcoholism and trauma that caught Charlo in a continuous cycle of drinking-related offenses. The funding for the re-entry program ended last year, and its future is uncertain. Unlike most public defender’s offices in America, CSKT’s Tribal Defenders Office combines social workers and legal attorneys in a single office to address the underlying causes of clients’ criminal activity to keep them out of jail. This model follows traditional indigenous beliefs which focus on the person instead of their crime. Most public defender’s offices in America concentrate on their clients’ courtroom appearances – they do not offer services beyond legal defense. The CSKT tribal defenders address the issues that can lead to arrests including poverty, mental health, addiction, housing problems, cultural disconnection, and historical trauma through multiple unique programs. They are the only office in Montana, and one of 24 in the nation, practicing this model of public defense. It is a “holistic model,” that the New York Bronx Defenders pioneered in the 1990s to tackle the issues that push people into the criminal justice system. The tribal defenders’ frustration with their clients continuing to show up in court inspired them to look for solutions in 2008 for outside factors that contribute to criminal behavior. This eventually led them to apply for technical assistance in 2011 from the Bronx Defenders, which they received. This model of defense gained recognition in 2017 when Montana Gov. Steve Bullock signed a bill establishing a state program that will directly mimic the “holistic model” of the CSKT Tribal Defenders Office. Ann Miller, the managing attorney of the Tribal Defenders Office and Charlo’s attorney, calls Charlo her superstar. When Charlo entered the re-entry program in 2016, she was struggling with a life-long alcohol addiction that started when she was 15 years old. She never remembers the desire to drink, but she does remember wanting to fit in and be accepted. At 16 years old Charlo became involved in a physically abusive relationship with a man 18 years her senior. He moved her to Great Falls where he kept her locked in an apartment with their daughter while she was pregnant. She used alcohol to deal with the trauma. “I was always drinking to try to forget,” she said. To escape that abusive relationship, Charlo stabbed the man with a butcher knife. She remembers jumping into her car and peeling out so fast from a parking lot she thought her car would crash. She drove pregnant on an empty gas tank in her Toyota station wagon until her car ran out of gas right below Rogers Pass. She waited in the dark summer night with her daughter in the back seat for her brother and mother to arrive in a van to pick her up. She cried the whole way back to the Flathead reservation. “I thought I’d killed him with the butcher knife,” Charlo said. She did not. But it was the beginning of decades of abusive relationships. Charlo’s history is typical of women convicted of crimes in Montana. Statewide and nationally, female incarceration rates are increasing faster than for men according to the Montana Department of Corrections 2017 report. “Women’s involvement in the legal system frequently begins with personal histories that include trauma, poverty, lack of educational opportunities, addictions and mental health concerns,” it stated. In Montana’s Women’s Prison, more than 75 percent of women had criminal behavior linked to one or more of these factors. Native Americans are also overrepresented in Montana’s prison population according to a study by the Council of State Governments Justice Center in 2017. Native Americans represent under 7 percent of Montana’s population but account for 17 percent of Montana’s adult prison population. The study also found that drug arrests which are most often linked to substance abuse issues, are one of the leading causes of incarceration. Arrests for drug offenses increased by 62 percent in Montana from fiscal year 2009 to fiscal year 2015. Virginia “Tiny” Charlo (right), 57, has been in the criminal justice system for 38 years. She began working with the Salish & Kootenai Tribal Defender’s Office in 2016. She says that she has been sober and out of prison thanks to Susette Billedeaux (left) and the rest of the caring staff. Both physical abuse and DUIs have persisted throughout Charlo’s life. The abuse started with her mother and continued onto six abusive relationships with men including two marriages. At 19 years old, Charlo got her first DUI charge. She was 56 when she was charged with her last DUI. Charlo has collected 13 driving under the influence convictions over the last four decades in Washington and Montana. She spent six months in Montana’s WATCh program, a residential felony DUI treatment program, after a DUI charge in 2011. It was her fourth DUI in recent years, and she was sent to the treatment program instead of prison. She stayed sober for almost three years after graduating the program, but eventually relapsed. A few years later, in 2016, Charlo was charged with her most recent DUI. The cops pulled her over a block away from home one night. She was trying to drive a stray cat away from her home after her mother, in her late eighties, tripped over it. She failed to use a turn signal at a stop sign. She said her blood alcohol level was barely over the legal limit, and she was still on probation from a previous DUI. She remembers trying to hold together the tear in her nightgown with her cuffed hands while the cops arrested her. It was her fifth DUI, and she faced prison time or another six months in the WATCh program. But Charlo’s recent enrollment in the tribal defenders’ re-entry program in 2016 before this DUI, allowed her to serve her sentence without leaving home. She is nearly halfway through her probation sentence from that night. Before enrolling in the re-entry program, Charlo pushed through court appearances and sentences to simply be able to drink again. The support provided by tribal defenders helped change her outlook. Charlo has been sober for almost two years. “When my mom passed away, I didn’t want to be brought back in shackles,” Charlo said. 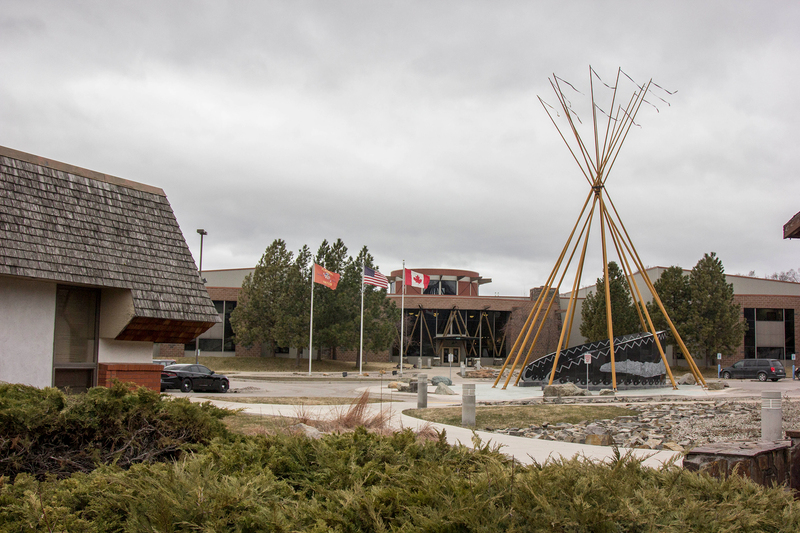 The majority of the Confederated Salish and Kootenai Tribes government buildings sit within walking distance of each other off of Highway 93. The tribal council building holds council every Tuesday and Thursday. The holistic model adapted by the CSKT tribal defenders represents a more traditional tribal viewpoint of justice according to Maylinn Smith, the co-director of the Margery Hunter Brown Indian Law Clinic at the University of Montana. She also represents tribal members in CSKT court in civil cases and has served as a chief tribal judge in Utah. “They are a tribe I view as going back to that traditional model,” Smith said. She describes the defenders approach to public defense as providing “wrap around services” for the client. She compares their methods to restituition instead of retribution. She thinks their model can create systemic postive changes in tribal communities and restore customs and traditions. Virginia “Tiny” Charlo helps take care of her mother in Arlee, Montana. 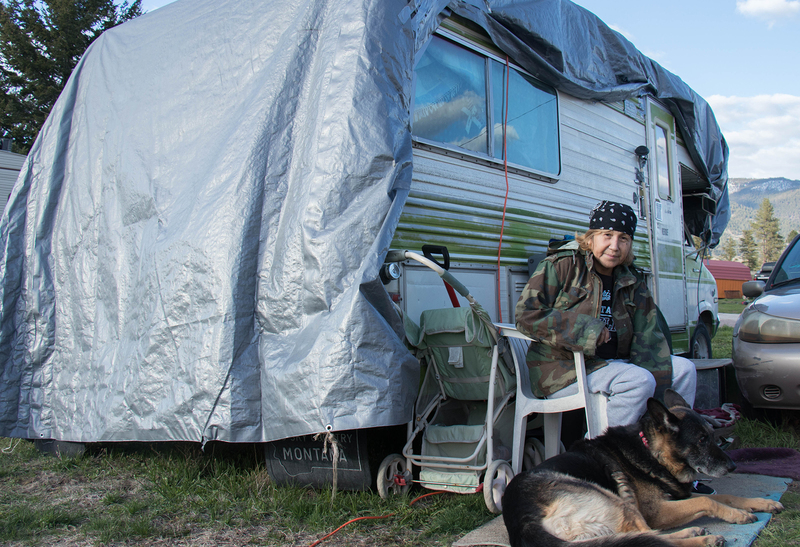 She lives in a small trailer outside her mother’s home with her German Shepard, Peja. The tribal court on the Flathead reservation was established in the early 1950s and today sits next to the tribal jail in Pablo amid CSKT’s other government buildings. As sovereign nations, Native American tribes can create their own justice systems depending on what they can afford. Because they lack the funds to create their own justice system, many tribes rely on the federal government to enforce justice on reservations. Tribal judicial systems are limited to prosecuting only tribal members in tribal court — even if a non-tribal member commits a crime on the Flathead reservation, the tribe has no jurisdiction. The tribal defenders are able to adopt a holistic model of defense because they have more liberty to change and room for growth within a tribal government than a typical overloaded state public defender’s office. The CSKT judicial system handles misdemeanor charges within the reservation bounds of all registered tribal members, and the courts in surrounding state counties often prosecute the felony charges of tribal members. “I think it is a wise use of resources to attack these problems in the way that [Miller] is,” said James Lapotka, the head criminal prosecutor in Lake County who prosecutes tribal members for felony drug charges. “My job at its absolute base level is: I read police reports about probably the worst days of some people’s lives and I judge them off of a report of the worst day of their life,” Lapotka said. This method cannot address the issues in a defendant’s life or avoid negatively affecting positive things in their lives like jobs and housing stability. “It is very easy to treat people like numbers and to focus on this specific criminal conduct that brought them into court,” Lapotka said. He said that a court can handle a drug crime for half the cost in the long run by putting an offender into an addiction treatment plan instead of jail. “The best way to do that is maybe not to focus on that one really bad day of their life and give them some support on the things that they need,” Lapotka said. “Our method of addressing our clients’ issues, is part of the solution to an overcrowded criminal justice system,” she said. According to a 2017 study by the Council of State Governments Justice Center, Montana’s jail population rose almost 70 percent from 2011 to 2013, causing overcrowding across the state including in and around the Flathead reservation. The defenders’ office works on an open-door policy and anyone can walk in with a question, whether it is about a warrant, driver’s license, eviction, or child custody issue. This is the office where Charlo regularly checks in. “These guys are my antidepressants,” Charlo said. To her, the tribal defenders helped her stay sober and out of jail. With a recently adopted blind German Shepherd attached to one hip and her three-year-old grandson attached to the other, a smile absorbed Charlo’s cheeks. She talked about the success she feels she has reached with the defenders’ help. Success to her means no longer wanting to drink. “I am not gonna say I’m living for my grandkids because everything I am doing is for myself,” Charlo said as her bashful grandson buried his head in her lap. The re-entry program that Charlo went through in 2016 ran out of its main funding when a two-year federal grant expired. Parts of the program are still being strung along as the defenders wait to see if they receive grant funding in the fall of 2018. The re-entry program has helped almost 300 tribal members returning to the reservation from jail or prison. The tribal defenders’ re-entry program is tackling the numbers of tribal members who break the law after returning to the reservation from jail. Sixty-six percent of people released from prison did not return to prison within three years of their release in Montana, according to the 2017 Montana Department of Corrections biennial report. The tribal defenders define recidivism more narrowly than the state, as any legal conviction, not just reincarceration. In the first year of serving clients through the re-entry program, over 64 percent of people in the program were not convicted for any crime. Miller said this data suggests the defenders are on track to meet the same, or better, recidivism rates than the state of Montana. The defenders view their program as successful because the clients were lifetime repeat offenders prior to entering the re-entry program. Desiree Fox, the defenders’ psychologist, said sometimes a person’s upbringing makes them more susceptible and visible to the criminal justice system. “They do end up coming back to this community [from incarceration] so why wouldn’t we want to help them be successful,” she said. The psychology services that she offers to clients in the defenders’ office is unique to the holistic model of defense they practice. Clients who are being legally represented by attorneys can access mental health care in the same building. Virginia “Tiny” Charlo has battled with alcoholism for over 40 years. On April 23, 2018 she stands in front of her trailer in Arlee, Montana. She has been sober for over 18 months and says that for the first time she knows in her heart that she will never drink again. As Charlo restores her life, she wants to start to bead again. A large beaded bald eagle covers the back of her leather jacket. She explains how she made it while running her fingers over its raised yellow beak and white shiny feathers pieced together by sesame seed sized beads. “I made up my mind when these guys started helping me,” Charlo said of the tribal defenders. She has relied on their services the past few years as she faced trauma and addiction problems. A huge part of the tribal defenders’ practice is simply advocating for their clients outside of the courtroom with housing authorities, driver’s license issues and other stakeholders within the Flathead reservation’s community. They host community outreach events to show how the criminal justice system is not necessarily set up for positive change with their clients and how it can criminalize mental illness and addiction, Miller said. “In order to advocate for them, we need to tell their stories because our clients are more than they are accused of,” Miller said. She believes the way the defenders use an all-encompassing approach allows them to understand the historical and cumulative trauma affecting a client and how resilient they are to survive it. “The holistic defense practice is trying to build on people’s strengths and their right to live their lives in the context of their families and the context of their culture and community,” Miller said. 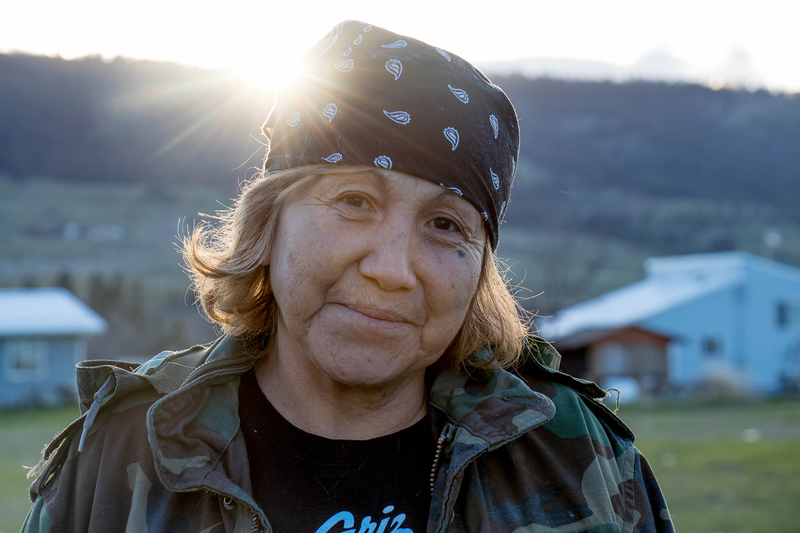 The years of abuse Charlo endured imprinted upon her that she was “nobody.” The support of the tribal defenders went beyond the services they offered her. They believed in rehabilitating her life despite decades of repeat criminal charges. Everytime Charlo was feeling down, she came into the office, not to talk to anyone, but just to sit in one of the green waiting room chairs as people filtered in and out. Everything would lift off her as she sat there. After, she would walk out of the office and everything was okay. “They have faith in me. I learned to have faith in myself,” she said.